It's the ideal entry-level monosynth, and its open source architecture only sweetens the deal! Filthy analogue filter. Tiny form factor: 4x4 inches. Open source. Since Korg's Monotron appeared in 2010, synth manufacturers have been falling over themselves to create cheap and cheerful analogue synths. 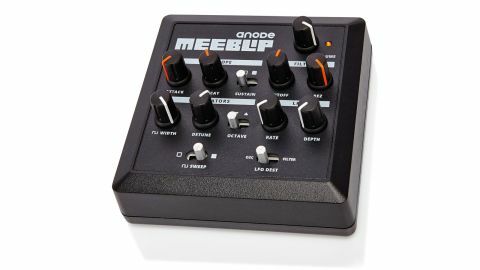 The latest to hit the market is the anode from MeeBlip, a collaboration between createdigitalmusic.com's Peter Kirn and Blipsonic's James Grahame. Priced at a wallet-friendly £110, the anode's reasonable cost and meagre form factor (a mere 4x4 inches) belie its clever design and big, dirty sound. "The filter's unique selling point is its phat, filthy sound, and MeeBlip have pulled a blinder in this department"
The synth is based around dual digital pulse wave oscillators, the second of which can be tuned up or down eight semitones via a Detune knob. There's also an Octave switch which when activated transposes the second oscillator down 12 semitones - great for beefing up certain patches. A Width knob sets the width of both pulse waveforms, and takes the sound from a big full-on square wave to a thinner timbre. Fixed-rate pulse width modulation can also be applied to the first oscillator with the Sweep switch. While its not possible to get a huge variety of tones, the oscillators sound great across their entire range. The Envelope panel is even more pared down than the Oscillator section, featuring just Attack and Decay time knobs, and a Sustain switch that toggles between AD and ASD envelopes. In ASD mode the sustain is fixed and the Decay works as the sound's released - very straightforward. The Attack and Decay times can be made good and short, but there's not too much in this area to write home about. The Filter section is where the synth's crown jewel - its analogue filter - is located. This is a apparently a Twin-T notch filter, but don't worry if that doesn't mean anything to you as it behaves like a regular low-pass filter. "Despite its basic feature set and limited range, the anode is a top-notch budget monosynth"
The filter's unique selling point is its phat, filthy sound, and MeeBlip have pulled a blinder in this department - sweeping the Cutoff results in some fantastically grungy noises, and with the resonance turned up the filter begins to self-oscillate, resulting in some absolute filth! When the filter isn't fully open, velocity modulates the cutoff frequency, allowing for some expressive playing. The synth's simple LFO can be applied to either the filter cutoff frequency or the pitch of both oscillators. The LFO doesn't have a huge maximum speed and can't be retriggered with a note on message, but there's still plenty of potential here for simple sound design. Control wise, the only way to trigger the anode's sound is to use the MIDI in port, and you can set the synth to receive notes on channels 1-4. A cool touch is that you can access a couple of hidden parameters via MIDI CC. The first can be used to dial in a velocity controlled envelope to filter cutoff modulation, and the second is glide time. Output wise you're looking at a single 1/8-inch stereo jack output, though, while the synth outputs a stereo signal, the left and right channels will always contain the same information so the synth is effectively mono. The other input is for DC power, and it's worth noting there's no battery compartment. Clearly, the anode has its limitations, but it's got one more trick up its sleeve: it's completely open source, and you can download the schematics and code right off the MeeBlip site. If you like to tinker with your hardware or software this is a big bonus, and will likely make the synth a must-purchase for tweakers. Despite its basic feature set and limited range, the anode is a top-notch budget monosynth. It's the ideal entry-level synth if you want to get some analogue kit without breaking the bank, weighing in at less even than Korg's Volca range.